Over the past few years, ‘Digital Transformation’ has become a buzz-phrase. The scope of the phrase is such that it conjures up various visuals depending on the audience. 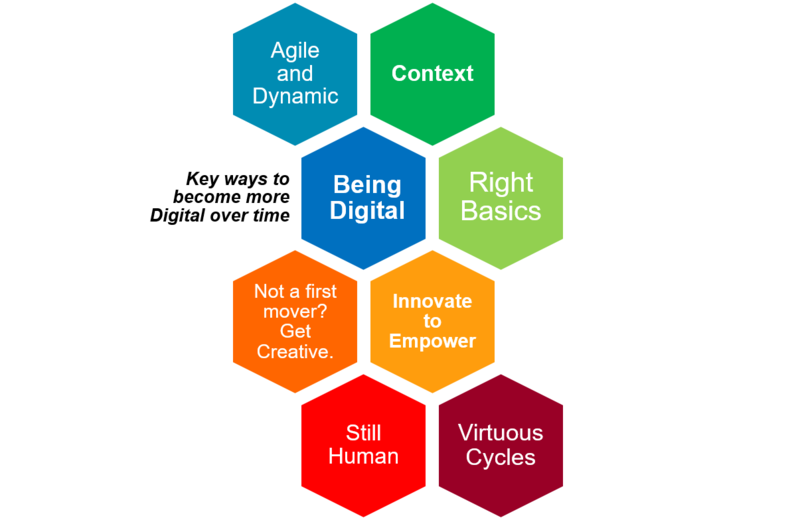 In my experience working with various companies, digital transformation is often thought about as having a snazzy interface (much like a Uber or Airbnb) and some bells and whistles that very few clearly understand. Let me try to summarize what ‘Digital Transformation’ is not and what it can be. (At the end of this post, there is a good graphic to help guide you). Try answering the questions: Why do we need to become Digital? How will it help? If your company is a food delivery operator, your digital tools may include various capabilities for various actors in the whole chain – customers have a cool app to place orders and track their delivery, the kitchen manager whose iPad flashes with new orders and guides triaging orders (based on expected prep times, customer loyalty, value etc.) orders, the food delivery person whose device is updated with new routes (based on traffic, order size, customer queues, important customers that expect more immediate service etc.). If you are a manufacturer of turbines for wind power, your Digital may mean transparency into the supply chain needed to create the windmill blades for the shop floor manager but its not necessary to have true real time capabilities or a flashy app. A near-real-time (NRT) feedback into potential maintenance issues or predictability based on incoming weather will be useful. For both cases, you will need to analyze which parts of your ecosystem to invest in and how directly it leads to bottom-line profits. So, understanding the context is essential to digital success. I have had interesting discussions with clients who want to be AI-ready or ML-ready, but they are still reporting KPIs on weekly spreadsheets. And then, most companies (because of various unintended reasons and natural evolution of data infrastructure) have inconsistent data across key variables. As a result, basic information about customers and business lines are often flawed or cannot be trusted across sources. There are multiple 360 degree views of the same customer, for instance. To implement digital transformation in pieces does not require cleaning up the universe of data across the organization (although it is ideal) or having fully robust datamarts that are easily accessible/relational/editable/IAM-gated, etc. But the aspects of data that will impact the pieces of business intended to be digitized are important to be clean, reliable, secure, non-siloed and easily accessible. If not, then, there may be errors ranging from serious (say, a wrong campaign being sent to the wrong customer which turns the customer off) or at a minimum, sub-optimal experiences for customers. (For example, in the previous example of the food delivery business, the triage system may indicate that one order that is $100 from a low-loyalty customer be prioritized over a $25 order from a highly loyal and higher value customer). Beyond the data aspect, it is also important to have a supporting operating model with clear governance and roles, as they will drive everything that happens with the data that is collected. Any business transformation (in corporate history) has succeeded and endured primarily because the transformation has considered the wishes, behaviors and continuous feedback from the customers who use the final product. Even if you are doing a digital transformation in HR processes (which may appear far away from your customers), the results will show in the product or service that you finally deliver to your customers. It is also important to think about second, third and nth order impacts of your digital efforts. Uber did not just make it easier to order cabs, it also set up new expectations from customers and led to development of other services such as UberEATs. A century ago, Ford did not just make the Model T in an assembly line process, it also taught America what to expect as part of the driving experience. We can draw upon many examples like this – Tesla, Netflix, Apple, Airbnb, etc. Empowered customers (even internal users are customers) will drive your efforts further and result in new business opportunities that you may not have thought of when you first embarked on the transformation effort. I have seen companies adopt various digital efforts without thinking about system optima. One example is the fairly ubiquitous chatbots. In an effort to cut customer service costs (which is a desirable goal, if executed well), companies have adopted them widely. The risky bet is that the chatbots can replace real customer service agents even in complex situations because the current crop of chatbots are ‘ready enough’. Many customers may not notice that they are chatting with a machine (online or voice), but many discover when it is already too late and they demand to be transferred to a real human with unknown amounts of resentment. In this example, it would have been better to inform customers upfront about the use of a chatbot. For every application of digital technologies, it is really important to consider various scenarios and customer journey stages and to evaluate if any potential cost savings may be negated by customer frustrations (which can often be long term) and new process complexities. Users will not adopt newfangled technologies if they are not friendly. Many organizations take a very linear view of digital transformations. You have done steps 1 through 4 and now, it is time to plan for step 5. This view may be true in many business situations. But, it is always prudent to be aware of how the latest transformation steps are already changing things (and prior steps) and how, if we have to start over again now, would we change our approach and realign our steps ahead. The disruptive strategies adopted by Amazon (which include multiple digital initiatives), for instance, could have made it the best bookseller on the planet anyway, but they didn’t stop there. Over time, with the data that they collected, they not only learned what books their current and potential customers wanted to read, they also created a top-of-the-line recommendation engine which can often predict what you need before you know you need it. The same can be said of transformations at Marriott/SPG, where they not only strive to deliver world class hospitality but can also predict experiences that customers may treasure and tailor such experiences. So, instead of a linear path, depending on your context, you should have enough loops or dotted lines in your transformation journey which can help you quickly re-orient in a rapidly evolving world. Moreover, thinking about how interoperability can be achieved (using APIs most often), is crucial to creating synergies across different parts of the organization (and yes, ‘synergy’ is still an overused word!). Yes, it is great to be a first Digital Mover and that can place you beyond the reach of immediate competitors. Nowadays, it is hard to think of a third ride-sharing company. But all is not lost when you did not make the first move. For example, Walmart, realizing that they are way behind Amazon when customers think about ordering online, is investing heavily in digital efforts both by developing internally and acquiring companies such as jet.com and flipkart.com. You may not have the resources of a Walmart, but even that should not deter you from attracting customers with your digital efforts. If, for instance, a big grocery chain offers online ordering and free pickup at an appointed time, being a smaller, more local player, you can create new value by having the groceries delivered (and tracked online) or a monthly membership which allows customers to try out new recipes or cook with your guest chefs in your test kitchen (which can then be digitized and shared with a broader community). Booking air tickets has been highly democratized by Expedia and Google Flights, but airlines are creating new value drivers for customers by not only offering the same low price as in search engines, but also offering to create ‘experiential trips’ for customers. Being constantly creative is a key success factor in any business transformation. Digital and beyond! Few companies have the muscle (resources, financial etc.) to affect digital transformations from a CXO level or for the whole organization. Instead of a big bang approach, which is fraught with risk, it is better to identify the key areas where digital may have the most immediate and effective impact. Then, learn the lessons from such smaller implementations and roll them out to serve broader aspects or bigger parts of the organization. For example, if you are a retailer and have no big digital strategy, it is alright to start small. Maybe create an app that allows stockers to stock the shelves most optimally, based on prices, brands, line of sight, and packing efficiency. As you roll this out, you will start learning what works and what does not. Take those lessons and try creating another pilot on the ordering system or the POS system. Gradually, you will become more digitized than you ever thought you could be. At the same time, it is also important to quickly abandon efforts that are not paying off or have no potential payoff in the future. Being flexible in making quick decisions and smaller implementations may often be the kickstart you will need to be on your digital transformation journey. Wondering where your greatest digital opportunities lie? We help brands like yours develop a holistic digital strategy that brings landscape, business, and customer perspectives together to solve your challenges and identify new opportunities throughout the lifecycle. Learn more here. Whether you’re looking for a digital partner to help with strategy, design, innovation or implementation, we’re here for you. Get in touch with our team to learn more. We are a diverse team of engineers, designers, and strategists passionate about solving complex business problems.